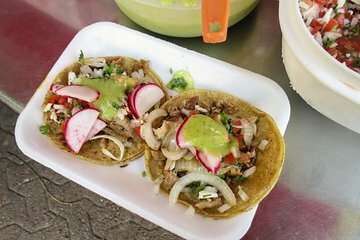 Bring your appetite on this 2-hour foodie tour in Playa del Carmen. By taxi and on foot, an in-the-know guide whisks you to five of the best restaurants and street stalls not frequented by tourists, where you will sample authentic Mexican cuisine, made up of Maya and Spanish influences. At an open-air farmer’s market, learn how fresh ingredients are used in dishes. Discover places and foods that you never would have found on your own! Xantal made an amazing host as we toured various eateries around PDC. Our favorite was the cochinita pibil at the nearby park. We also really enjoyed the quesadillas which were more flavorful and less greasy than the ones in the USA. We also enjoyed visiting the market. We even bought some goodies to take home! The tour is published as taking 2 hours. It probably took closer to 2.5 hours, but the time passes by really fast. If you are looking for something different to do in PDC other than hanging out at the beach or the local bar, do this tour. You won't regret it! What fun! Our guide was very knowledgeable about the foods of the region. The different foods and beverage combined were great. I was thrilled to go on this PdC walking Food Tour. I enjoyed eating where the locals dined and while this wasn't a 'fine dining' experience, we did discover the depth of flavour put into many of the regional plates we tried. One highlight for me was going through the market and discovering all the spices! Our guide Xantal was wonderful. The tour company had suggested we postpone the tour due to the heavy rains of tropical storm Cindy but we love the rain and persisted. Xantal was a great sport about it. The foods were all delicious, but the Cochinita Pibil young pig cooked in a pit one of those taste treats that defies hyperbole. I will do this again on my next trip here and take better notes next time. As a foodie, I wanted my first trip to PDC to be amazing and this excursion was the perfect conduit! From the first stop, to the last, our tastebuds were very happy!! Our tour guide was very personable and easy to talk with. It was a wonderful primer. Would love to see new excursions added to continue our appreciation of this region of the world. This tour was perfect, just what we were looking for. Xantal took us to several eateries and described how their preparation and cooking methods were authentic. The food was very tasty! We also went to an open air market for the fresh produce and other ingredients. Xantal is very personable and knowledgeable- a perfect tour guide. A great tour. I would recommend this to everyone. It gets you out of the fifth avenue grind and into areas of Playa Del Carmen you would not go. The food is great and it is REAL Mexican food! Very knowledgeable and very well done!! Our tour guide Alexandria was amazing! Good was delicious, and i would recommend this hands down!! Definately a taste of real Mexico! Excellent tour. Highly recommend. Good way to try authentic Mexican food in places a tourist would probably not stop at. This was an absolutely bgreat tour. Everyone should try it. Alessandro, our guide took us our group of four five vendor/restuarants and a food market. we walked,rode and ate deliciouys Mexican cusine. She was very informative and told us a lot about native foods, spices and Playa del Carmen. I hiighy recommend this tour and this tour guide. we saw parts of Playa del Carmen we never would have visited on our own, and back at the resort we recommended it to all we talked to.